Replacement wand handle assembly in Iron / Red for your Dyson DC25 vacuum cleaner. 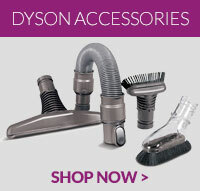 Genuine Dyson .. Pack of 2 compatible replacement drive belts for Dyson DC25 vacuum cleaners. ..
Dyson groom tool which removes loose hair directly from your dog before it's shed around the home. C..
Genuine Dyson vacuum cleaner mattress tool assembly. .. Replacement dust bin assembly for Dyson DC25 vacuum cleaners. Replace your damaged bin with this gen..
A genuine part, this Dyson foot pedal spring is designed to fit with selected DC25 vacuum cleaner mo.. This plastic washer is a genuine spare part for select Dyson vacuum cleaners ..
Genuine part to fit Dyson DC25 vacuum cleaners .. Compatible replacement Dyson DC25 base plate suitable for all Dyson DC25 vacuum cleaner models. C..